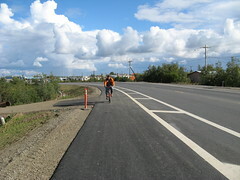 Tom’s riding his bike to work now that the road work is finished to the wildlife refuge headquarters. The city is putting in a new road on the entire highway, 6 plus miles, and including a bike lane. Everyone is enjoying the paved bike line, joggers, strollers, bikers and walkers. The bikes are a huge advantage over a car now. It has taken me a half hour to go to and from work because of the construction traffic. That seems for a 3 mile drive. Maybe I will use my bike next week too. While we still have daylight and the road work continues. We added a Saturday bike ride to our routine. 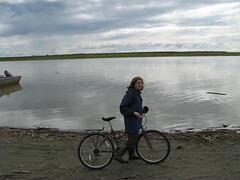 Here I am biking along the river. We are enjoying the 60 to 70 degree heat. We stopped at the V.I.P restaurant on the way home for a drink (nonalcoholic of course). I ended up enjoying sushi and Tom had a burger. Never guessed you could get sushi in Bethel. They even offer a fried sushi roll on the menu. I know you are busy but when you get your e-mail up and running, drop a line. It’s beautiful here, temps in 70s during day and high 40s-50s at night. We had a good week off last week with fishing on the flowage, a day hiking in the Porkies, a day on Madeline Island (Terry’s first visit ever!) and a lot of freezing of veggies. I really planted way too much squash. Terry told me last night he’s getting sick of zucchini (even though I’ve been trying to be creative). Hope all is well. Miss you. Sounds like Chicago traffic – LOL. Glad to hear that you are settling in fine. Hope everything is going well. I have been checking in to hear about your adventures. Keep us posted and let us all know how “school” is going so far.